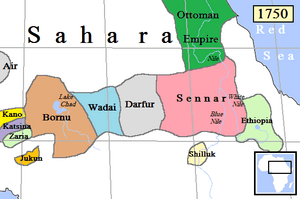 Abyssinia, also known as the Empire of Ethiopia, was an old empire. It included Ethiopia and Eritrea. When it was biggest, it had some of Egypt, Sudan, Yemen, and Saudi Arabia. It ruled from 980 B.C. to 1974 A.D., where it was overthrown by communists. At the time of its overthrow, it was the longest-lasting government in the world and one of the only two nations that did not get colonized in Africa. Abyssinia Facts for Kids. Kiddle Encyclopedia.